On Wednesday afternoon a trainer at SeaWorld Orlando was killed by an orca named Tilikum (also known as Telly). The 12,000 pound male orca pulled trainer Dawn Brancheau underwater by her ponytail during a live performance. Due to his enormous size and abundance of testosterone Telly is often kept isolated from the other orcas at SeaWorld, deprived of the constant social contact that killer whales have in the wild. In addition to forced isolation, whales in captivity are deprived of their natural instincts, crammed into tiny concrete tanks devoid of sea life or the stimulation necessary to nourish their intelligence. Such conditions can cause stress, erratic behavior, and insanity. This is the third trainer that Tilikum has killed in 19 years. “I can’t really blame Tilikum. If I was taken from the ocean and plopped into a concrete prison cell for four decades I would be inclined to get a mite angry also. No reasonable person would walk unescorted across the exercise yard of a maximum-security prison, and it is irresponsible to expect a frail human being to turn his or her back on a stressed-out, angry, captive orca – the most formidable predator on the planet. By the way, I’ve met Tilikum. Way back in the 80’s, I toured SeaLand of the Pacific as a special guest of Bob Wright, the owner of the facility. He wanted me to see first hand what his business was all about. I sat by the pool and patted the big Orca on the head. I also put my hand in his mouth and put my palm on his tongue so he could taste that I was not afraid of him. I remember looking into the left eye of that magnificent predator, and what I saw there was resignation and sadness. He was not a happy whale. I knew then as I know now that Tilikum should not be, and does not belong in a swimming pool. I think that Sea World has only one honorable option. They should return Tilikum to his home in the sea. His pod can be identified and Sea World has the funds, the skills, and the technology to do the right thing both for the Orca and for the interest of humanity. Telly’s life will be spared, for the time being, as SeaWorld executives determine what to do with him. They continue to imprison Telly – endangering both human and animal life – because he is profitable to their enterprise, having fathered 13 calves and by bringing in audiences. Urge SeaWorld to release their imprisoned animals! A zebra, captive of the Ringling Bros. Circus, escaped from her prisoners and ran around Atlanta, Georgia, for 40 minutes. Lima, a twelve year old zebra, was galloping along a busy interstate during rush hour traffic. She was eventually cornered by police officers on motorcycles and returned to her captors. Lima also escaped from 1st Mariner Arena in downtown Baltimore, Maryland in 2008, accompanied by two other zebras, together they dashed into traffic. 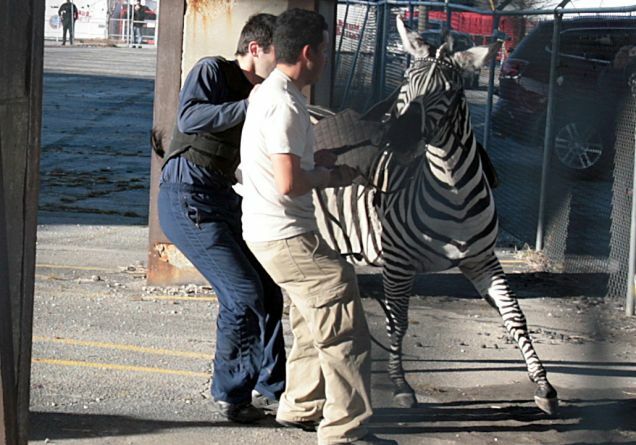 In 2007, the same three zebras escaped while in Colorado. This comes as no surprise since there are numerous cases of animals escaping the evil clutches of the Ringling Bros. Circus. For an extensive list of Ringling’s offenses and casualties, check out the Ringling Factsheet.